Jordan was already the GOAT before his stint in Washington, but watching one of my childhood heroes struggle in his autumn years was most disturbing. 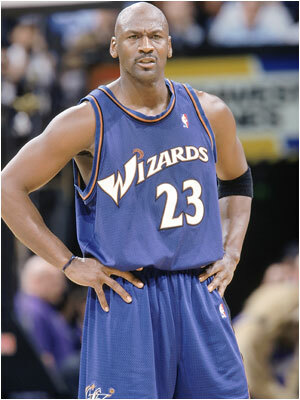 This may be why you don’t see many Wiz fans (that are sane) wearing his jersey at the Verizon Center. The “Chief” collected a ring riding the pine during his ’96-97 season with Chicago, but don’t expect too many Celtic or Bulls fans to honor his legacy by sporting the old red and black. ‘Nique will always be remembered for his high flying dunks, and the legendary playoff duel between his Atlanta Hawks and Larry Bird’s Celtics. 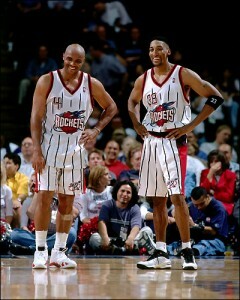 Seeing a Wilkins C’s jersey only cheapens this historic showdown. These two greats both led small market teams to the NBA Finals, but unfortunately (for them) had to take on Jordan and the Bulls. 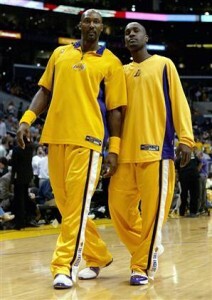 Instead of retiring with grace and dignity, both jump ship, and cling onto the Showtime Lakers in hopes of a title. Their plan backfired, and Malone never got his ring, but Payton did the same thing with Miami, and cashed in. “Chewing” could have made this list for his time on the Magic, but since he coaches them now, Seattle is a better fit in the “unwearable” department. 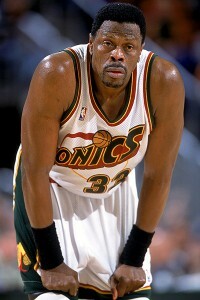 Now that the Sonics are defunct, this jersey may experience a renaissance, unless former Sonic fans decide to wear Hersey Hawkins instead. 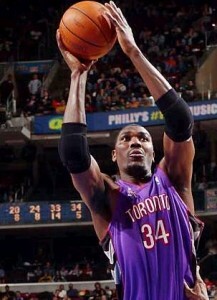 Not only did the Raptors have cheesy/horrible uniforms during The Dream’s one season in Toronto, the two time NBA champ should’ve known the “dream” was over. 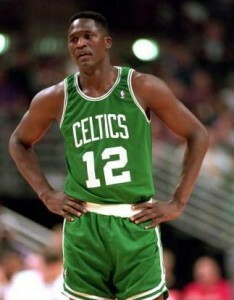 The Pistol played his final season in Boston, but was a mere shell of his former self that year. 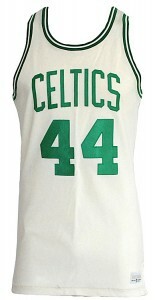 Sadly, the Celtics won a championship the very next season, with Maravich no longer part of the team. Sure some fans wear this jersey for it’s sentimental appeal, but a more approriate choice would have to be purple and yellow (LSU or Jazz). 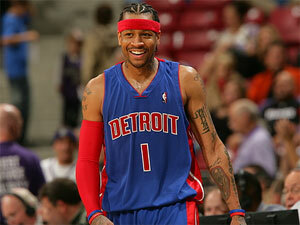 I have a sneaky suspicion there are not too many Detroit fans wearing an Answer jersey these days. The catastrophic trade that landed Iverson will go down as a blunder that rivals the drafting of Darko Milicic. 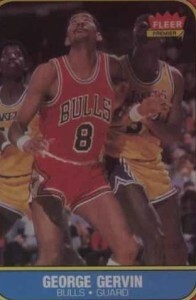 Iceman made himself a legend during his time with the Spurs, but played a final year in the NBA with the struggling Bulls. 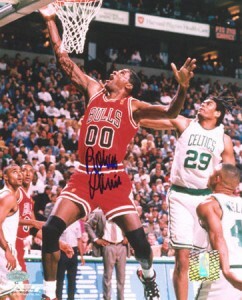 You will NOT see Gervin jerseys at the United Center, trust me. Mullin is a tweener, but is on the list as a HOF finalist. The flat-topped shooting star enjoyed All-Star status and Dream Team immortality with the Warriors, so it was unflattering to see Mullin on the Pacers. He did play well those last few years, but the bread and butter of his career comes from out West. If it ain’t Nuggets, you have a jersey that NOBODY will wear. That’s all folks. Come back for Part 2, where we will break down the NFL’s most unwearable HOF jerseys. Feel free to comment on someone I may have missed. 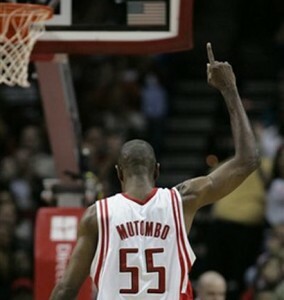 Mutombo may have played for a lot of teams, but as a Rockets fan I’d be proud to own a Mutombo Rockets jersey, he’s just that great of a guy. Also, his days with the Hawks were worth remembering. 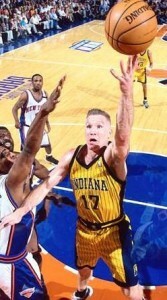 Chris Mullin was a huge part of the Pacers getting to the Finals. A used Mutombo Hawks jersey with a stain on it just sold for $526.00 after 71 bids on eBay so….and ANY Jordan jersey is in demand, including Space Jam, White Sox and Barons.